In the summer of 1963, Marine Major Steven Hebert, an African-American, is assigned to the US Embassy in Saigon to serve as head of security. His real mission: to spy on diplomatic and military activities to help keep US ground troops out of South Vietnam. At this time, South Vietnam is in turmoil, caught in a conflict between the Catholic president Diem and the Buddhist monks and general population. President Kennedy is determined not to place more U.S. troops in Vietnam while still helping the South Vietnamese defeat the communists. Steven’s mission is made more difficult by the presence of CIA operative Lucien Conein, who is helping certain factions within the CIA and the U.S. government, including Ambassador Henry Cabot Lodge, to remove Diem. Steven is able to learn much from the various diplomats and military that move in and out of South Vietnam and protects Ambassador Lodge even though the tumultuous times result in Diem’s murder. Steven is rewarded for his actions and sent home to meet President Kennedy. Lansdale considers recruiting Steven to join his Psy-ops team, approved by President Kennedy when Steven gets caught up in the conspiracy of the assassination of the President. 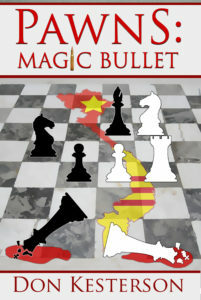 Purchase Pawns: Magic Bullet as an ebook through Kindle. A historical novel dramatizes volatile disputes within the Kennedy administration over the Vietnam War. In 1963, Vietnam is a political tinderbox for President John F. Kennedy. On the one hand, he wants to limit the number of American troops there, but on the other hand, a robust U.S. military presence is necessary to defeat a triumvirate of enemies: Chinese Communists, the Viet Cong, and the belligerent North Vietnamese. In addition, South Vietnamese President Ngo Dinh Diem, a Roman Catholic, insists on persecuting the Buddhist majority, who protest with increasing boldness. Nevertheless, the chief difficulty Kennedy seems to face in Vietnam arises from internecine conflicts within his own administration. A cabal of U.S. government groups, led by Ambassador Henry Cabot Lodge and the CIA, works against Kennedy’s wishes in order to depose and potentially assassinate Diem. It’s into these tumultuous circumstances that U.S. Marine Maj. Steven Hebert is sent to Saigon, officially to function as the head of the embassy’s security and unofficially to keep tabs on Kennedy’s enemies in South Vietnam. Hebert encounters a relentless effort to remove Diem for nefarious reasons—Air Force Lt. Lucien Conein, a CIA operative, directs that mission partly to ensure the reinvigoration of the opium trade through French Corsican connections. Meanwhile, Thomas Warren, an FBI agent and a victim of an American program to experiment with LSD as an instrument of mind control, investigates Kennedy’s extramarital affairs. This first installment in Kesterson’s (The President’s Gold, 2013, etc.) Pawns series is astonishingly well-researched, the result of that rigor a vivid depiction of historical facts skillfully delivered within a fictional framework. The author is especially adept at explaining the fault lines within a frighteningly fractured presidential administration. Kesterson’s writing is clear and lively and more realistic than literary, which suits the subject matter. But the inner machinations of the American government were baroquely complex and ever shifting, and while the author does an admirable job imposing explanatory order on that chaos, those complications can become onerous to process. It would have been helpful to excise one of the numerous subplots. The one following the FBI’s surveillance of a potential presidential mistress didn’t require as much attention as it received. A deliciously inventive and historically astute political drama.